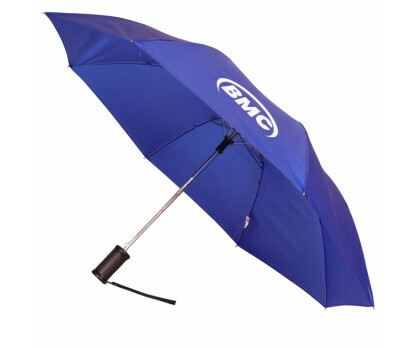 42 Inch Arc Custom Auto Open Folding Umbrellas are presented in a number of dual-tone and solid color choices. These auto-open 2 fold umbrellas can be folded to just 16" and thus they are easy to store in duffel bags and backpacks. The two-tone design, hand grip, and strap make the handle beautiful and practical. Matching sleeve, pongee canopy, and 7"W x 5"H imprint space in one panel are other highlights of these custom umbrellas. Order these custom promotional auto open/close umbrellas today to get free design and free online proofs services. Request a quote to know price cuts that you can avail for wholesale 42 Inch Arc Custom Auto Open Folding Umbrellas.